“Africa United is the story of modern-day Africa told through its soccer. Traveling across thirteen countries, from Cairo to the Cape, Steve Bloomfield meets players and fans, politicians and rebel leaders, discovering the role that soccer has played in shaping the continent. He recounts how soccer has helped to stoke conflicts and end wars, bring countries together and prop up authoritarian regimes. Not a lot of people know that I’m a football fan. Well, not exactly a fan—but I enjoy watching football. Of all the sports out there, football is the only one I can actually see myself playing. Now, if only I had better coordination. But that’s a subject for a different kind of blog post. When I saw Africa United, I was intrigued. Reading the back cover, I thought it would be sort of like Pacific Rims—except with football as the sport instead of basketball. And during the time I bought the book, I was still on a Pacific Rims high. (To be clear, this was after I read the book—way, way before the book-signing event last month.) So I picked Africa United up—and bought the book. Fast forward to some months later, I started reading the book. Three weeks later, I finally finished it. Normally, I would attribute my slow reading pace to being busy with work, and because I tend to read more slowly when it’s non-fiction. But Africa United was only ten chapters long. And it wasn’t a thick book to begin with. I just found it really boring. Each chapter of the book relates to one African country. And I think that’s the problem with the book. Each chapter has its own story to tell, and most of the time, it doesn’t relate to the other stories being told. For a book called Africa United, its stories don’t seem to be very united. Or, at least, it doesn’t to me. Whenever the author wants to get a point across, like how good a team was prior to a certain event, he would rail off a few points of historical data—and then go back to his narrative. This was, quite honestly, jarring for me as I didn’t expect that there was a going to be a trip down history lane. Whenever this happened, I had to do a number of re-reading to make sure I didn’t skip a page or miss out on a paragraph. It was definitely disconcerting. 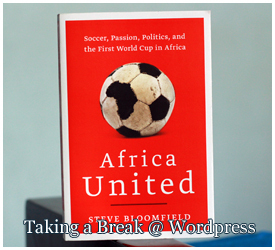 When I started to read Africa United, what I really expected was to learn more about Africa through the sport they play—and the political climate the continent is in. I got much of the latter, but of the former, the only thing I gleaned from the book was this: Africans love football. A lot. I know I really shouldn’t compare it to Pacific Rims. I mean, one book is about basketball, and the other football. That alone means I shouldn’t compare—but I can’t help it. I’m not a basketball fan, but I saw how author Rafe Bartholomew loved the game through his writing. Steve Bloomfield claims the same for football, but I never felt it through his writing. Reading Africa United was like reading an online news article—except it wasn’t just a few paragraphs long. And it took forever (an exaggeration, obviously) to finish. Do I regret buying Africa United? Well, not really. Books like this make us appreciate those we liked all the more. But if I could go back in time knowing what I know now, I might have passed on this book. according to the time stamp on my inset image, i bought this book last july. and i spent close to two weeks reading the book. does that mean i didn’t like the book? no. it only means i had a harder time than usual reading it. first of all, i’m not a fan of basketball. the only reason i picked up the book was because i was intrigued as to how the author, a foreigner, sees the philippines. modern-day philippines, and not the philippines in school textbooks. and second, i do take longer when reading non-fiction, than when i read something fictional. i don’t know why. in the end though, only one thing was important to me. was the book worth buying? yes. and i’m glad i bought it. PACIFIC RIMS reads a little like an underdog novel. you are introduced to your main characters, the ‘losers’ so to speak, and then you join their journey to become champions. rafe bartholomew, the author, spent three years in the philippines to experience first hand the “unlikely love affair” the philippines has with basketball. having lived here all my life, i don’t actually get the “unlikely” part of the love affair. i’ve lived knowing that filipinos love basketball. i’ve never taken a liking to it, because of my ineptitude in sports, but i’ve seen enough of it to know that it’s a very filipino sport. basketball is like a short soap-opera. you have heroes, antagonists, powers-that-be, all mixed with talent and chance. it’s a live theater production that people can relate to because it has simple rules. it’s entertainment in its purest form. and like most popular soap-operas, it’s free to watch on television. and for a price, you can watch the magic live. 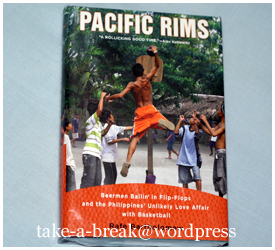 reading PACIFIC RIMS, i was amazed to find myself getting sucked into the world of philippine basketball. as i already mentioned, it’s an accepted part of life. i was just never a fan. and i’m not claiming that the book converted me into one. it hasn’t. but for the days that i’ve been reading the book, i felt part of that world. i guess i should credit that to the author’s way of writing. it’s very inclusive. when you read mr. bartholomew’s accounts, you’re not just reading about his experience. you feel part of the action. also, the book doesn’t romanticize the sport, but you can see just how the author loves it. it comes off in the writing. the best part? the actual games. i’ve seen a few basketball games, so i remember the exhilaration of watching it live. and the author was able to put that exhilaration into paper. you can really see (and feel) rafe bartholomew’s love for the game through the words. and because of that love, the words transform themselves into an experience you feel while reading his accounts. and then there are the segues. basketball being an intrinsic part of filipino culture means it touches upon other parts of the filipino psyche. the author touches on some of them in the book as well: from how politics had involved itself in the game, to the integral part it plays in societies–it even has part of a chapter set in the world of entertainment. the book trailer i’ve seen of PACIFIC RIMS mentioned that it’s not just a book about basketball, it’s a book about the philippines. and i agree. i can also say that it’s one of the most accurate description i’ve seen of the philippines in print. then again, most of the things i’ve read about the country are either praise releases, or condemnations. so i salute rafe bartholomew, a foreigner who is more filipino than most of our celebrities, for writing about the philippines without prejudice and bias. but before i completely end this post, i just have to mention something. rafe bartholomew’s haunts in the book, ateneo de manila, araneta coliseum, and even his stint in BAKEKANG, a local soap opera, where the places i’ve been to during the same time. his first year in the philippines, when he was researching at the ateneo library, was my last year of school in ateneo; BAKEKANG was one of the first shows i handled during my time as a features writer for a local entertainment website; and as for araneta coliseum? i’ve never been there during pba games, but i’ve been there (and around the area) for so many times because of events i had to cover. why do i note this? because throughout rafe bartholomew’s three years in the philippines, while he was moving around the same circles i was, i never saw the things he saw. for me, that time was a new chapter in my life, but everything was pretty much same old, same old. but for him, it was a whole different ball game. pun, not intended. i love zombie-anything. really. being of the queasy nature, i actually have no idea how i fell in love with the concept of zombies. maybe it’s the fact that you can actually kill zombies. goodness knows i’m useless when it comes to ghosts. 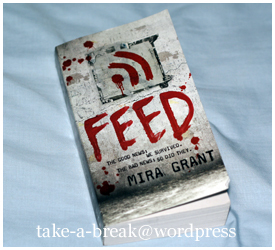 i found out about this book through another book blog, one that held a competition to give away a copy of FEED, because the blogger enjoyed it so much. this being a book on zombies, and seeing (reading about?) someone else enjoying it so much she’s willing to give a copy away had me intrigued. having tried the e-mail us option of FULLY BOOKED, i asked if they still have a copy of FEED locally–and where i could find it, if they did. they told me they had one last copy at their rockwell branch, and that they would be willing to transfer it the branch nearest me. so i thanked them and moved on. i got the book last monday, and i’ve read it every chance i got. it hooked me, definitely. the story is pretty straight forward. we follow three bloggers as they themselves follow the campaign trail fo a senator hoping to become the republican ticket to the presidential elections. that in itself is interesting topic, seeing as blogging is (right now) a non-traditional media. and you can never really censor what a blogger would say about you or your campaign. now, set the whole thing in a post-apocalyptic world, where the apocalypse was brought about by the introduction of zombies. suddenly, the game is different. on top of the probably intrigues that will crop up, there is now also thrills and danger, and the inevitable deaths that will come as soon as the zombies arrive on the scene. FEED is an adventure set in a political background with tinges of espionage. it’s a page-turner, and it definitely kept me reading way into the night, even when i’m to have an early morning the next day. so do i recommend this book? hell, yes.